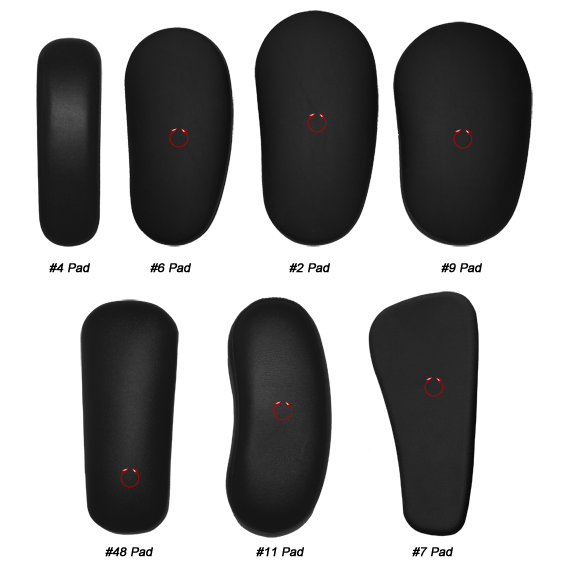 A proven favorite, the Marathon Series was designed to provide the ultimate contour fit with integrated lumbar and thoracic spinal support, and extensive personal adjustments. Our flagship multipurpose task chair, the Marathon has been specifically engineered to support virtually all users between the 5th and 95th percentiles. Classic stitching details compliment the choice of six available seat sizes, with High Resiliency or Energy Absorbing foam options. The same care to stitching is applied to the sculpted back, which is available in two sizes. 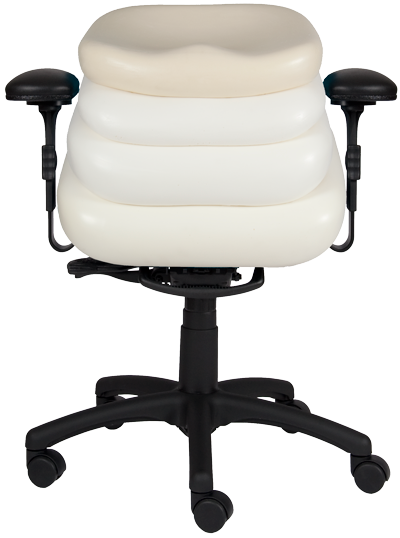 The 4326 comes standard with an air pump lumbar that can be adjusted to support various lumbar curves. Backrest Width: mid - 19½ high - 19½"
Backrest Height: mid - 19½” high - 22½"
BUILT2LAST™ mechanisms have been customized to ensure that the tilt ranges and back angles match perfectly with our proprietary J-Bar designs to achieve proper ergonomic range and seat to back relationships. Adjustable arm bracket mounts are welded directly to our controls to ensure their strength and exact location. 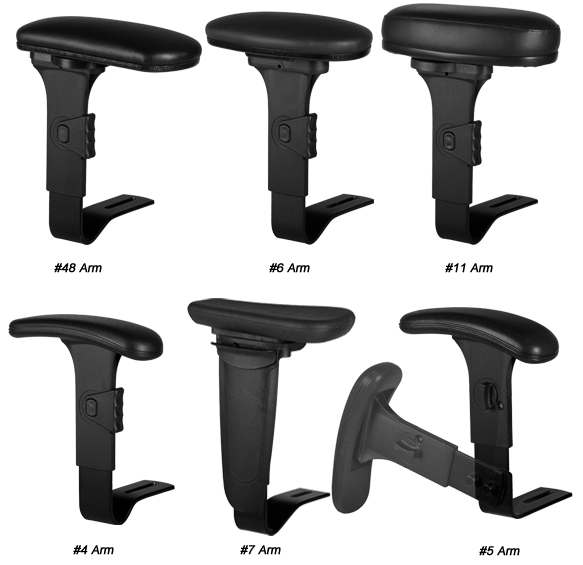 Independent adjustments for seat height, seat angle, back angle, integrated seat depth adjuster, plus swivel tilt and infinite tilt lock. 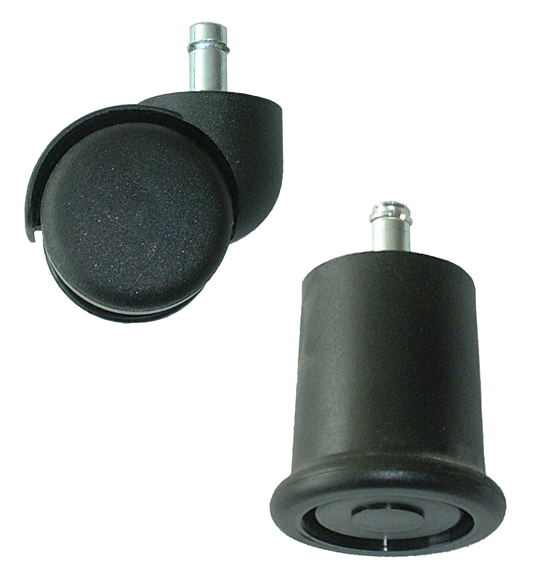 This allows the user to position the chair in any stationary position throughout its tilting range. The forward tilt dial allows the user to choose a resting seat angle of 3½° rearward , or a forward incline of 5° or any value in between. Back height adjustments can be made in 1/2” increments while seated, with our internal ratchet system. 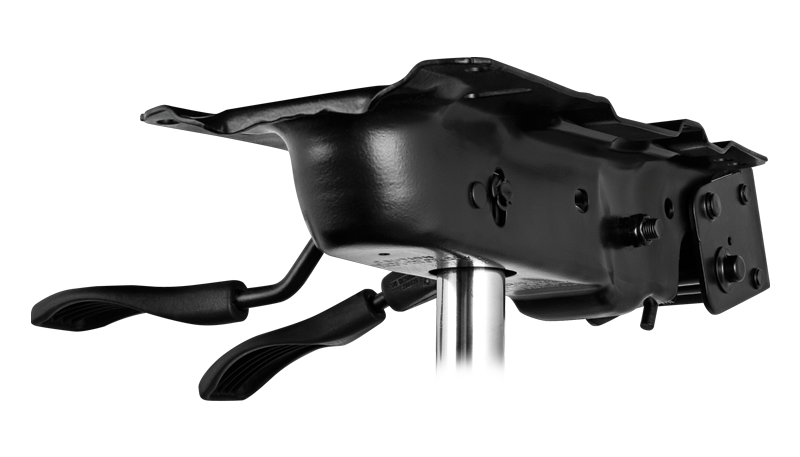 The Knee-Tilt mechanism includes most of the same features of the Multi-Tilt, with the additional benefit of an enhanced forward pivot point and also includes the integrated seat depth adjuster. This allows the operator to easily recline in the chair while keeping their feet firmly planted on the floor. Back height adjustments can be made in 1/2” increments while seated, with our internal ratchet system. The Enhanced Forward-Tilt / Knee-Tilt mechanism includes all of the features of the #5 Knee-Tilt, with the additional benefit of enhanced forward tilt to a maximum of 6° forward and also integrated seat depth adjuster. 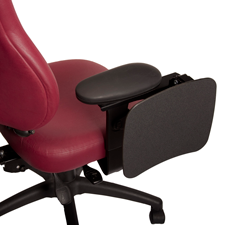 This allows the operator to easily recline in the chair while keeping their feet firmly planted on the floor as well as the ability to put the seat pan into a forward tilting mode allowing for a more open trunk to thigh angle which results in a healthier more lordotic spinal curve while seated. Back height adjustments can be made in 1/2” increments while seated, with our internal ratchet system. The Synchronous (Synchro)-Tilt mechanism is a unique action unit that closely mimics the body's natural pivot points at the hip, knee and ankle for a comfortable and fluid seated experience. The back to seat ratio of 1.87:1 makes the act of reclining (with feet firmly planted on the floor) and returning back to an active working posture effortless and completely natural. This mechanism also has the ability to alter the back to seat relationship with its back angle control lever and integrated seat depth adjuster. Back height adjustments can be made in 1/2” increments while seated, with our internal ratchet system. The seated body has natural pivot points at the hip, knee, and ankle. The ideal work chair will mimic as closely as possible those pivot points, thus allowing the sitter to move naturally and with ease around the chair’s engineered pivot points. The pivot points within the user’s body and the movement of the chair should work together to create a tilt movement that doesn’t stress or lift the body. The type and engineering of a work chair’s tilt will make the difference between dynamic and static seating. A chair with a center tilt pivots around a point under the center of the chair’s seat. In this simple design, the chair’s back and seat usually move together in a 1:1 ratio. This means the sitter’s feet will come off the floor when leaning back, and it will be difficult to hold a reclined position in any relaxed fashion. Because the sitter’s feet come off the floor, the chair with center tilt will give the seated user a feeling of instability. A chair with a knee tilt pivots the chair’s seat around a point under the seat and behind the user’s knees. The user’s feet will stay on the floor, which lends greater stability and provides user control over the recline action of the chair. A chair with a knee tilt pivots the seat and back, though not necessarily at the same rate. Because the seat-to-back ratio is still fairly even, the user’s body angles will not comfortably open and relax when reclining, increasing the chances for muscle fatigue and restricted circulation. A chair with a hip pivot rotates the backrest around a point located near the user’s hips. 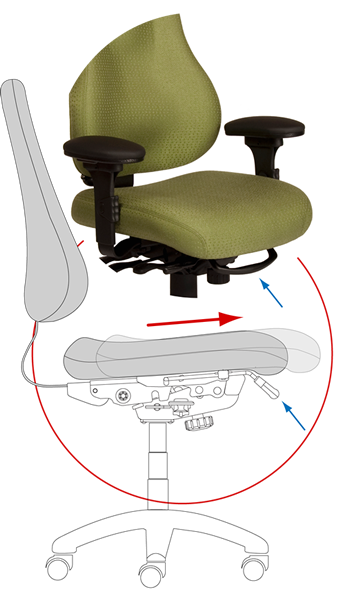 This point, which is between the chair’s seat and back, helps the user to maintain full contact with the chair’s seat and back through the full range of recline. The chair’s pivot closely mimics the body’s hip when the sitter tilts back in a chair. 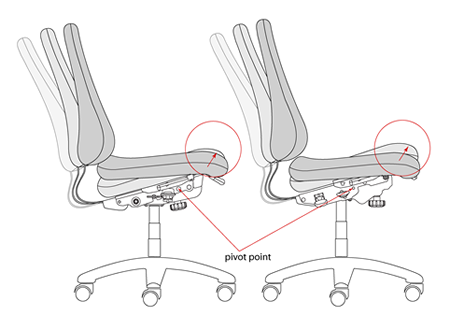 A synchronous tilt establishes a prearranged relationship between the movement of the chair’s seat and back. This relationship allows the body to open up as the user reclines. A work chair that has a synchronous tilt and can closely approximate the ankle and hip pivots of the body may provide a comfortable and relaxed experience for the sitter. Our universal arm fastening system allows for simple, tool-free installation and width adjustment of all arm styles. All BUILT2LAST™ task chair arm models can be easily added, removed or even exchanged with other BUILT2LAST™ chairs. 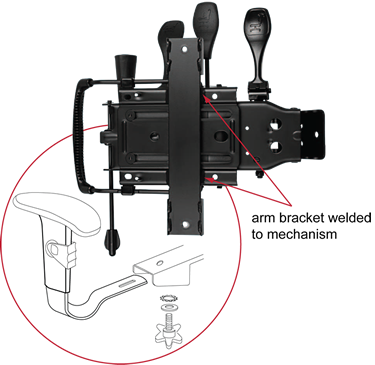 Welded directly to the chair's mechanism, the universal arm bracket is an integral part of the chair control for unsurpassed strength. The structural strength of the seat pan is not compromised the way it is in most competitor's chairs due to the fact that our metal to metal connection does not make any contact with the more fragile and vulnerable hard wood seat pan core. This means your BUILT2LAST™ chair will have an incredibly long service life and that your seat pan will maintain it's original strength and shape allowing it to provide the support it was designed to provide. 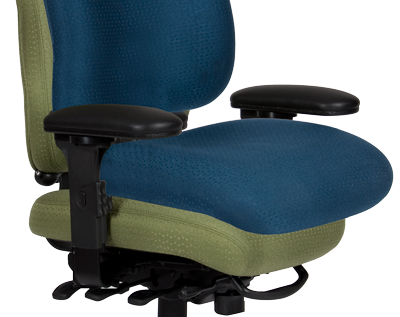 We recognize the importance and ergonomic value of being able to customize every aspect and detail of your Built2Last chair and with that firmly in mind we offer three different arm rest adjustment brackets. When combined with the inherent adjustment built in to each bracket and the range of arm pad options below, we believe that every user and possible task can be accommodated. Too low may cause you to lean over to the side to rest one forearm. This can result in uneven and awkward postures, fatiguing the neck, shoulders, and back. Too high may cause you to maintain raised shoulders, which can result in muscle tension and fatigue in the neck and shoulders. Too wide cause you to reach with the elbow and bend forward for support. Reaching pulls the arm from the body and can result in muscle fatigue in the shoulders and neck. Too close can restrict movement in and out of the chair. Too large or inappropriately placed may interfere with the positioning of the chair. If the chair cannot be placed close enough to the keyboard, you may need to reach and lean forward in your chair. This can fatigue and strain the lower back, arm, and shoulder. Our classic and time tested 1/4 pivot mechanism has proven to be a long-time best seller. 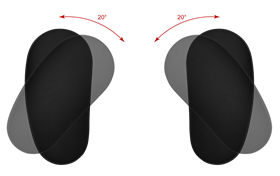 The centrally located pivot point allows pivot adjustments to be made without affecting the fore/aft location of the arm pad. This option tends to be ideal for the multi-tasking and moderately intensive computer user. This pivot style is incorporated into our #6 configuration and pad. Our full 360 degree pivot mechanism adds a greater degree of flexibility in terms of arm pad placement. 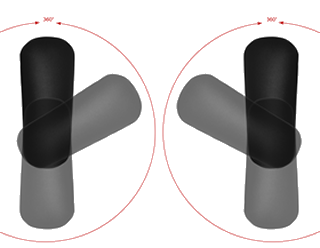 The pivot point is located slightly rearward of the centre point allowing for two distinct fore/aft placement options. 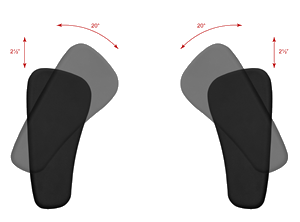 The increased pivot range allows the arm pads to be brought closer to the user. This pivot option is ideal for intensive computer users. This pivot style is incorporated into our #8 and #9 configurations and pads. Our tracking arm mechanism has a unique motion. 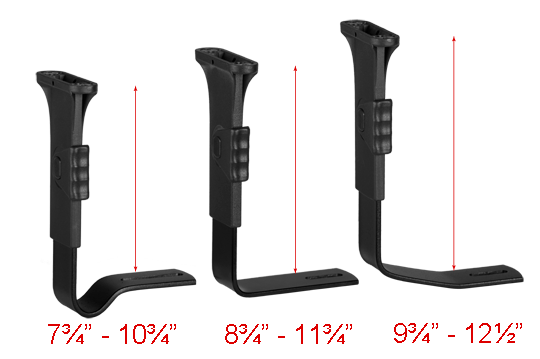 As the arm pad is pushed forward it will simultaneously angle in 20 degrees toward the user. It is an acceptable travel for many tasks and applications however, if greater micro-adjustability is required the other pivot mechanisms may be a better fit. This mechanism is incorpoated into our #7 configuration and pad. The AR400 allows that same user to simply flip and rotate a personal work surface directly into their convenient and comfortable reach zone. It is even possible to recline slightly while performing these tasks greatly enhancing the user’s comfort. Writing, paperwork and tablet computer operation are some of the common uses we have been made aware of however; the possibilities really are nearly endless. To factory specify this option on your Built2Last chair see the heading above "Custom Arm Configurations", create a customized arm option using the instructions in that area and add the character T to that code. To follow the above example Arm Configuration Code M6T would incorporate our medium height arm bracket with our #6 arm pad and quarter pivot mechanism along with our AR400 tablet on the right arm. At this time we are only able to offer a right-handed tablet mechanism, a left-handed model may be available at some point in the future. The seat depth adjuster is fully integrated on the #3 Multi-Tilt, #5 Knee-Tilt, #8 Enhanced Forward-Tilt / Knee-Tilt and #9 Synchro mechanisms. This feature allows individuals to fine tune their seat depth by up to 2½” in ½” increments while remaining seated. The ability to achieve the correct seat to back depth relationship dramatically enhances posture, support and circulation to the legs. **Please note: the location of the seat depth adjustment release has been changed from the front of the seat pan to the more convenient left side of the chair, making it much easier to adjust the seat depth while staying comfortably seated in the chair. The seat depth adjustment lever is the only lever located on the left side of the seat making it easy and intuitive to reach. 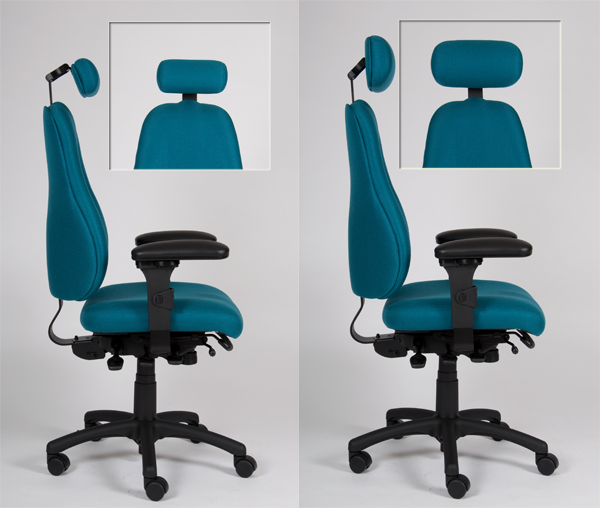 A properly designed and fitted headrest or neckroll can make all the difference in giving a user's neck and upper back muscles a break from the tiring task of supporting the head during computer, paper and a myriad of other tasks. 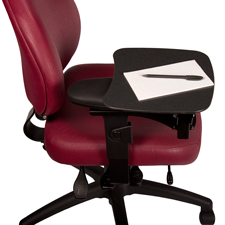 We offer two upholstered pad sizes: the larger is designed as a head rest the smaller is ideal as a neck support. The innovative mechanism with its self-ratcheting height adjustment and dual pivot points is able to be manipulated easily into an infinite number of positions to provide tailored support. The friction mechanism requires no knobs, levers or tools to be moved to a new position and holds its placement extremely well provided only normal force is applied to the pad. Our commitment to providing individualized solutions to ergonomic needs begins with our recognition that a properly fitted, comfortable seat is essential. All of our task chairs are available in thirteen different configurations of size, contouring and foam characteristics. All Built2Last™ seats are created from the highest quality materials, in proprietary molds and distinguished into two series by the characteristics of their contouring. 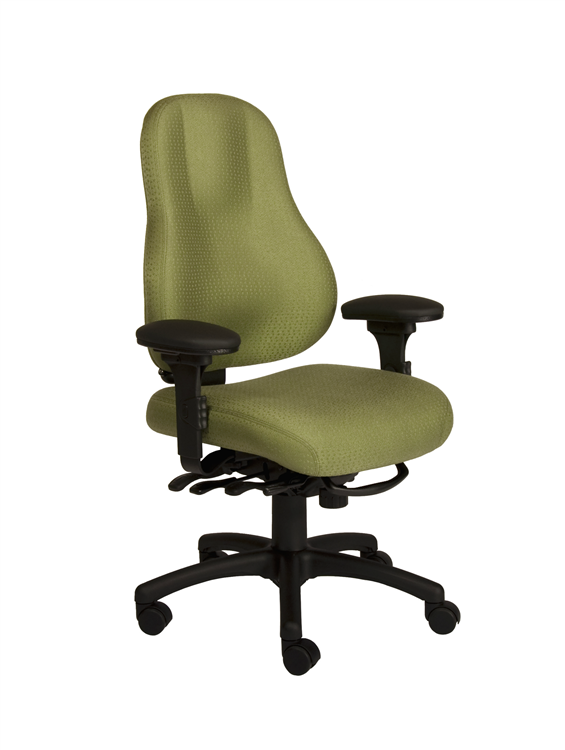 Unless specified, our task chairs ship with our Original Seat Pan (REG). 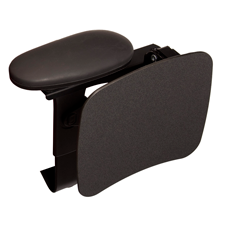 An inappropriately sized seat pan can be uncomfortable, provide inadequate support to the legs, and restrict movement. One that is too short can place excess pressure on the buttocks of taller users, one that is too long can place excess pressure on the knee area of shorter users and minimize back support. One that is too small can restrict movement and provide inadequate support. Prolonged use can restrict blood flow to the legs and create irritation and pain. Seat pan should be “depth” adjustable to adequately support taller users while allowing shorter users to sit with their back fully supported. The seat pan should provide support for most of the thigh without contact between the back of the user’s knee and the front edge of the seat pan. Provide a footrest, which may elevate the knee slightly to relieve pressure on the back of the leg. The seat pan of a chair is properly positioned when it allows for about two fingers to fit between the back of your knee the front of the seat. A proper seat depth setting allows the user to sit all the way back so the user can position the curve of the seat to meet their curves when sitting back and utilize the lumber curve of the chair back. A traditional seat cushion with gentle sculpting and a waterfall front edge, designed to maximize comfort and support. It is available in five sizes, all available in High Resiliency foam. The PSP, REG, LSP and MSP are all available in Energy Absorbing foam (EA). This series features both front to rear and side to side contouring with a gentle pummel in the front and a water fall front edge. It is available in two sizes, Petite and Standard, with either High Resiliency or Energy Absorbing foam. When you sit on a regular foam chair seat, the air in compressed cells pushes back against you as well as downwards. This causes pressure points, which can constricts circulation at the area of contact. When you place a load on a standard foam seat, it compresses but wants to spring back to its original shape immediately. The air in sealed foam cells has nowhere to go, so it pushes back to the same extent pressure is applied. Basically, the foam in the seat will not just want to spring back in the direction of your pressure, it will also want to spring in the opposite direction. When you sit on a visco elastic (energy absorbing) foam seat there is no air left in the cell to push back and cause discomfort. The air is spread to adjoining cells and the foam simply ‘melts’ under you to provide long-term, balanced support and comfort. A visco elastic foam seat reacts differently. Its unsealed cells ‘collapse’ under a load, compress fully and spread the air pressure within to adjoining cells. Because of the way visco-elastic foam deforms, it tends to shape to whatever is applying pressure, but it does not have the strength of spring-back pressure a more conventional foam with air-filled cells has. It is this ability to conform to our body’s shape that makes visco memory foam seats feel so unique. 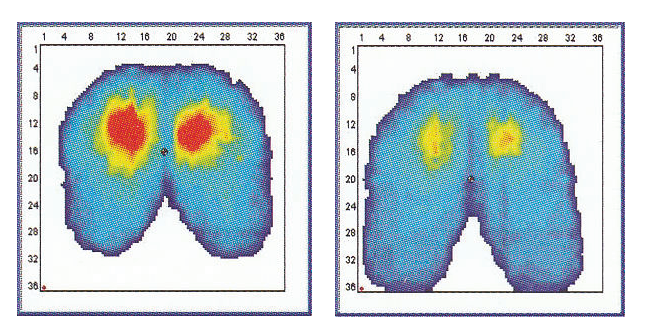 Pressure map images reveal areas of high (red) and low (blue) pressure on the buttocks while seated. In this example high pressure over the ischial tuberosities is greater in the conventional foam seat. The visco elastic foam seat disperses energy over a greater surface area, as viewed by the larger blue surface area. 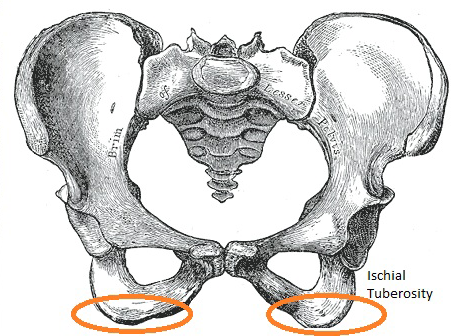 The ischial tuberosites make up only 8% of the seat surface, but carries up to 65% of the body's weight. 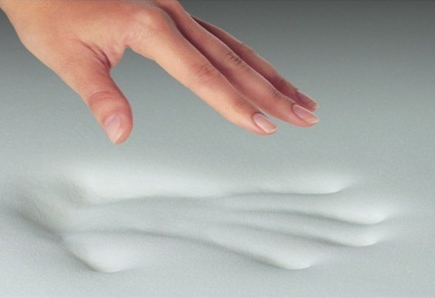 Visco elastic foam helps to evenly distribute the body's weight. 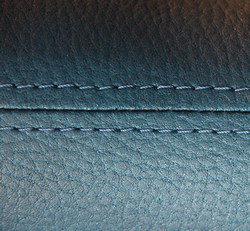 We have developed the “3-Panel Upholstery Technique” which does not compress the foam like our competitors who use the old-fashioned “pull hard and staple” method. Our classic french-stitching detail not only allows the foam to keeps its natural shape and design and to perform as it was designed and intended to, but it also gives the chair a much more substantial and high end appearance. By allowing the foam to fully return to its original shape after a long day of use the life span of the foam seat is also greatly enhanced, which is great from an economic point of view of course, but is also very responsible environmentally. A coccyx cut-out can be the solution to the problem of sitting for long periods of time for coccyx pain sufferers. The shape of the coccyx cut-out, which is fitted beneath the upholstery of the seat, will significantly reduce the pressure on the coccyx (or tailbone) which should allow you to stay seated for longer and to work without being distracted by back pain. Seat height is a crucial factor when creating a comfortable chair to work in. There are several factors that impact the correct height range for an individual user including user stature and intended task range. With these factors in mind our Built2Last line comes with several gas cylinder options to suit every user and every task. 5¼" (135mm) stroke 15" - 20¾"
8" (200mm) stroke 19½" - 27¼"
10" (270mm) stroke 23½" - 33½"